Not every railing application is the same. That’s why CertainTeed offers a complete system of railing, deck and porch post products plus accessories that meet a variety of needs for any application. 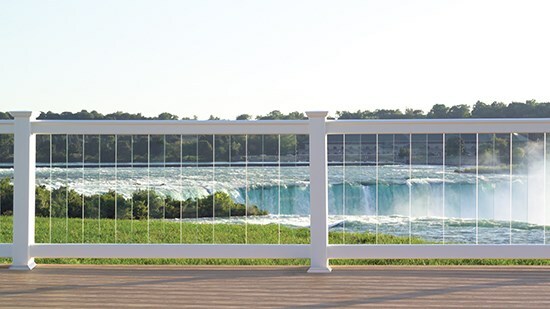 Our railing collection includes EverNew® vinyl railing and Panorama® composite railing. No matter which product you choose, CertainTeed railing combines exceptional beauty, durability and easy care – making it an ideal choice for any outdoor project. Each of our railing systems complies with the standards established by the ICC (International Code Council), an independent, nonprofit organization responsible for the development of national model construction codes. The ICC Evaluation Service, Inc. (ICC-ES) is the leading source of technical information on building codes, products and technology in the United States. ICC-ES conducts technical evaluations of building products, components, methods and materials. Building industry professionals look to ICC-ES Evaluation reports for evidence that products and systems meet code requirements. EverNew railing systems comply with the standards established by the ICC. The Oxford railing system meets the International Building Code (IBC) and can be used on both residential and commercial applications, including multi-family and over 3-story applications. This is due to the increased strength requirements needed for these types of applications. Oxford vinyl railing has undergone third party testing (as designated in report CCRR-0187). The Kingston vinyl railing system has undergone third-party testing (as designated in report CCRR-0211) and meets the International Residential Code (IRC), which means that it can be used on one-and two-family dwellings and multiple single-family townhouses not more than three stories in height. The Panorama composite railing system has undergone third-party testing (as designated in report CCRR-0115). Panorama also complies with the IRC code.